Messenger for Pokemon GO Free Download for Android: Pokemon GO App has become the most popular game around the globe, and there are millions of downloads till date. I am sure that no one is not aware of this game. People are becoming crazy with this game as it deals with the real time world. You cannot sit at home and play this game. You need to open the game and start moving from the place where you are and need to start catching Pokemon around you. 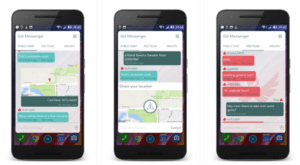 Apart from just playing the Pokemon Go, you can start talking with trainers near your area using Messenger for Pokemon GO 2.2.2 APK for Android for free. Also, download PokeVision for Pokemon Go and Prisma App for Android. If you have downloaded latest version of Pokemon Go, then you can start communicating with the trainers around your area. As we know, we need to protect the gym to gain more points and cross the level. You can join forces with others to conquer gym of others. You can also catch rare monsters and start lure modules using Messenger for Pokemon Go 2.2.2. In simple words Messenger for Pokemon Go allows you to start communication with trainers near your area for free. Messenger for Pokemon Go is not an official app from Niantic Labs or Pokemon Company. It was developed by the developer named Shadoweinhorn to help Pokemon Go players all around your area. It allows you to start the chat with the trainers based on the location. Messenger for Pokemon Go APK allows for team chat. To start using Messenger for Pokemon Go, there is no need to exit the game. It also allows you to share the location with your trainers. It floats like a bubble and gets integrated into your game. Next: PokeDetector Apk Download For Android Updated ! !